If you haven’t been using Google Alerts before then let me tell you that you’ve been missing out… This is one of those Google tools that’s not that heavily advertised so some people don’t even know it exists. So please let me, just in one sentence, tell you what this tool can do for you. Google Alerts can send you a notification WHENEVER someone mentions your name (or your business name) somewhere on the internet. There’s no better way of getting various information on what people are talking about your products (or your services, or your company, or you personally, or even about what your competition is up to) delivered straight to your inbox or RSS reader. What it means is that you can monitor the online presence of your brand at all times. This is a very powerful knowledge, I’m sure you understand this. If you know what people are saying you can always react to it with a proper message. You can put out fires around your accidentally flawed products, give discounts for every testimonial (as a surprise, of course, not as an incentive to receive one), or make it work for you in any other form. Now let’s get to the point and learn how to set up Google Alerts. It’s a simple form, just a handful of fields. The first one (“Search terms”) is the most important. Simply input the term you want to monitor. You can use all the standard google search operators there. So for example, if I want to monitor the occurrences of my twitter username around the internet the simplest thing to do is to just input “carlosinho”. But since twitter actually does a better job at monitoring itself then I want to exclude the results coming from twitter.com, that’s why instead of a simple one-word phrase “carlosinho” I would use “carlosinho -site:twitter.com”. This will exclude all the results from twitter.com, and give me only what’s left. This is just an example. You can use whatever term you like. It can be something as simple as your own name. Or your business name. Or names of your main competitors if you want to be up to date with what they’re doing. I’m using Google Alerts primarily for monitoring my blog’s name, its URL, my own name, and the most important keywords for my blog. I will get a little more in-depth into how this actually works in a minute, but for now let’s just focus on the other fields. The second field is “Type”. The default setting for it is “Everything” and I advise you to leave it that way. It means that Google will keep an eye on every type of content (videos, blog posts, tweets, articles, etc.). Eventually, if you end up with too many notifications besieging your inbox you can switch to a little more targeted monitoring, but “Everything” is a good starting point. The next field is “How often”. At the time of writing this post you can choose from three settings: “As-it-happens”, “Once a day”, “Once a week”. It’s Google asking how often you want to receive notifications. “Once a week” sounds reasonable because you don’t want to have your inbox flooded with alerts… this is what you’re probably thinking right now, but in reality “as-it-happens” is the best setting here. I will tell you why in a minute. The next field is “Volume”. Two options here: “Only the best results”, “All results”. There’s not much for me to explain here. I don’t know the algorithm responsible for deciding what the best result is and what isn’t, so you’ll just have to test it yourself. You can start with “All results” and then switch to “Only the best results” if you find notifications not that strongly related to your search term. Last field is “Deliver to”. This field provides you with two possible options: your gmail address, and “Feed”. The best choice here in my opinion is “Feed”. If you select this and press the “Create Alert” button you will be given a custom RSS feed. You can use this feed in your favorite RSS reader, or if you’re using Google Reader the feed will automatically appear there. This feed will contain notifications about the occurrences of your search term around the internet. What happens behind the scenes in Google Alerts is actually simple. Google Alerts provide a kind of window looking inside the Google Search Engine. What Google Alerts basically does is it looks at the current Google index and monitors it for any new entries. When a new entry appears and it gets indexed for your desired search term Google Alerts lets you know about it. It means that there’s only one flaw in this whole system. And that is you won’t be notified the minute something appears on the internet, but the minute Google stumbles upon it. Depending on the site where the mention actually happened the time difference between the mention appearing and Google finding it may be anywhere between 2 seconds and 2 months (a rough estimate). Despite this flaw the whole system is still working very well and providing valuable results. 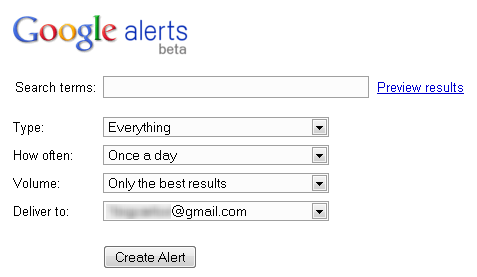 Now let’s take a look at some clever examples of using Google Alerts. Yes, Google Alerts can help you with this one too. All you have to do is input the site address preceded by “site:” as your search term. For this blog it would be “site:newinternetorder.com”. Then choose “Feed” as the delivery method and hit the “Create Alert” button. What you will end up with is an alert notifying you about every new page within a given domain. Quite similar to what a standard blog RSS feed actually is. There is a slight delay with this method though, as I was saying earlier. You can use Google Alerts for some interesting things. Like, for example, monitoring how often Microsoft is mentioned on the Apple website (simply by using “Microsoft site:apple.com” as your search term), or monitoring every new squidoo lens on guitar playing (“guitar playing site:squidoo.com”), or monitoring what people are saying about a piece of software called Market Samurai on Warrior Forum (“market samurai site:warriorforum.com”), or what they are saying about Warrior Forum itself in various places online (“warriorforum -site:warriorforum.com”). Or maybe you’re interested in some WordPress advice. You can try “wordpress ~advice”. The “~” operator gives you all terms that are similar to “advice” (like: tips, questions, tutorial). The possibilities are endless. Here’s a challenge for you. You already know how to set up Google Alerts so now try to come up with an interesting search term for new alerts and then share it in the comments. I’m looking forward to seeing your ideas. P.S. There’s more tutorials like this one on this blog. For example: how to install nofollow blogroll links on your WordPress blog, and how to create a YouTube background. Google AdWords Tips 101: How Does This Little Money-Sucking Machine Work?